I've drastically reduced shopping at Whole Foods. I had to stop there yesterday, though, for something only they sell. I decided to befoul my soul and pick up some brussels sprouts there rather than make a separate trip elsewhere. 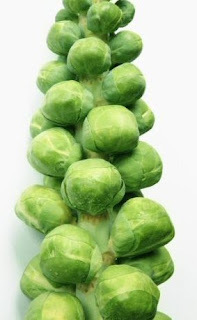 Whole Foods usually markets brussels sprouts lumped in a bin alongside many other tubs full of well-pampered vegetables, but they had run short of loose sprouts. As a stopgap they stuck two nearly yard-long stalks of sprouts in the bin. Shoppers had already assailed both. Enough remained for my household. I began picking and dropping them in a bag. It's a bit of a tedious endeavor but doesn't call for great strength. In terms of force required, on the spectrum between picking ripe raspberries and harvesting corn, it's there in the middle but leaning a bit towards the maizey end. There was a small but definite crack when I torqued each one away. About 30 brussels sprouts (some quite small) remained on both stalks. I decided to take them all. After I picked away for half a minute or so, a rather pushy woman viewed me from both sides and repeatedly leaned in to check the sprout level. She maneuvered her cart around. She vocalized nonverbally a few times (snorts, ululations, stridulations ...). Finally she said: "Oh, you're taking all the sprouts." "Yes, but I'm not doing it solely for eating. I'm mainly enjoying the itinerant farmworker experience." I left her a few anyway.